Please welcome our newest team member (and third Modern Mormon Woman), LJ, author of several great guest posts over the past few months. Read those posts or check out her bio. The first time I read The Hunger Games , I fell in love with the character of Peeta Mellark. I absolutely gobbled that guy up. He was strong, sweet, tender. I know that from a literary perspective he was written as a foil to Katniss Everdeen, the heroine of the series and who, in our world, would be the woman you see riding solo on a Harley down the freeway, her hair streaming behind her like a windsock. For all of you Team Gale women out there, know that I was totally there. I think every woman goes through a period where we dream of marrying a Mr. Darcy or an Edward Cullen (or, ahem, a Mr. Rochester). We want these guys beautiful, passionate, brooding. These men are free from things like nose hair or bad gas and when you ask them, “What are you thinking?”, they can come up with a flowery response on the spot, instead of saying “Nothing” and being completely sincere. I think it was then I knew on some deep, cosmic level that I had found my soul mate. We married a few months later and now have a tiny little version of my husband who is finally growing some hair. Anyways, this is why Peeta caught my heart strings in the book. Peeta was the one who, even while sick and dying, still sacrificed to keep Katniss safe and comfortable as possible. I think that kind of altruism shows an extraordinary depth of character. And yes, I know he’s a fictional character in a dystopian world and blah blah blah, but the point is, there are Peetas everywhere out there. They are the nice guys, the ones who are the antithesis of even my dear Eduardo Rochester. We all know guys like this, the ones who try to smile through a migraine, the ones who offer their seat on the bus and the ones who use the bottoms of their shirt to wipe the snot off your kid’s face when the last Kleenex is gone. Like Peeta, these guys are willing to work and sacrifice and protect you from your enemies or help you battle your inner demons. These are the guys who get out of their cars to pull debris off the road, the guys who dance with their grandmas at weddings, who treat service personnel like they’re human beings. These are the guys who are nice when no one is watching. 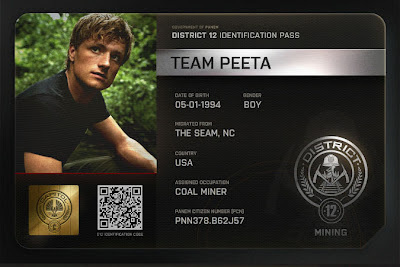 So let's hear it for Team Peeta, ladies. Let's rewrite the Panem anthem as an Ode to the Nice Guy and reward these men in our lives for their virtues, instead of wishing they were, you know, Liam Hemsworth.